Barbecue! We can’t get enough of it. So why not BBQ Salad? For this dish, we whipped up a batch of French-style salad dressing. You know, that orangey stuff from the 50s. But we replaced the ketchup with BBQ sauce, and made a few other adjustments. The result: Deep barbecue flavor. Enough said. We’ve seen this dish on restaurant menus, and even ordered it a few times. Problem is, restaurants often use regular salad dressing. That doesn’t make sense to us – barbecue sauce makes an excellent dressing ingredient. You can use any leftover barbecued meat for this dish – chicken, beef, pork, whatever. We particularly like Slow Cooker BBQ Pulled Chicken. Feel free to substitute ingredients or alter quantities to suit your mood (and what’s on hand in the refrigerator). This recipe takes about 15 minutes to prepare, and yields 4 main-course salads. Prep the salad ingredients: Wash the lettuce and spin it dry, then tear it into bite-size pieces. Peel the onion and cut it into thin slices or ½-inch dice. Wash the pepper(s) and cut them into thin slices or small dice. Microwave the corn (it’ll take 4 or 5 minutes). Measure out the barbecued chicken. Measure out the beans, if using (wash the gunk off first if using canned beans). Grate the cheese, if using. Make the salad: Add the lettuce to a medium-sized bowl. Add about half the salad dressing, then toss it with the greens until the lettuce leaves are lightly coated. Add the chopped onion, chopped bell pepper, and beans, then toss again. Add more dressing if necessary. Plate the salad: Divide the contents of the mixing bowl among 4 plates. Cut the corn into short pieces and add it to the plates. Add the chicken to the salad bowl, then toss it with the remaining salad dressing (you can skip this part if you wish). Top the salad plates with the chicken. Add a sprinkling of cheese (if using), and serve. In the salad we made for this post, we didn’t use the beans or cheese. But they’re nice additions. Spiced nuts (pecans or walnuts) would make another good addition. If you don’t want to use corn on the cob for this dish, you can substitute cooked frozen corn. Or just skip it entirely. If you prefer a slightly sweeter salad dressing, you can add a tablespoon or two of sugar to the mix. A small amount of dried mustard powder (maybe half a teaspoon) might also add a nice tang to the dressing. We don’t think black pepper is necessary for this dish, but use it if you like. Or add some at table. We think a tomato-based barbecue sauce works best for this dish. We like to use our own homemade Tangy Barbecue Sauce, but any good commercial version will work fine. “Blue Suede Shoes,” I said. “Heartbreak Hotel,” said Mrs K R.
“Fools Fall in Love,” I said. “That one should be our theme song, Hound Dog,” said Mrs K R.
Now this salad screams SUMMER out loud, John. I love the idea of using bbq sauce in the dressing. The salad looks superb! My husband will flip for this dressing! I can't wait to try it - he's such a saucy kind of guy - haha. Lovely salad! That is one delicious looking dish. Thanks for sharing that. Greetings! Hi Chris, we're practically living on salads this summer! Thanks for the comment. Hi Tricia, we're pretty saucy too. :-) Thanks for the comment. Hi Blogoratti, isn't it nice? And SO good! Thanks for the comment. I absolutely love bbq sauce in chicken and even tofu. Basically any kind of protein goes so well with bbq sauce. Looks so good! Hi Nisha, bbq sauce is nice with anything! Haven't tried it with tofu -- need to do that. :-) Thanks for the comment. Mmmmmmmm BBQ CHICKEN FOR THE WIN! I am ready!!! :) I have some chicken in the fridge and I am soooo making a salad like this for lunch! Hi GiGi, barbecued chicken is so good, isn't it? And wonderful in a salad. :-) Thanks for the comment. Sounds great John but to be honest my takeaway from this post is...drumroll...the Muny Opera! OMG the things you forget and the memories that are so sweet. How I loved going there in the summer; I'm now officially jealous! A great summer dish... and for the upcoming holiday, the 4th of July. I would eat and repeat! Hi Barb, the Muny Opera is great! They installed some new fans in the last year or two (or three?) that really work and make it a comfortable venue in July and August (for those that don't know, the Muny Opera is an outdoor theater). Thanks for the comment. Hi Denise, eat and repeat is exactly the way to eat this. :-) Thanks for the comment. 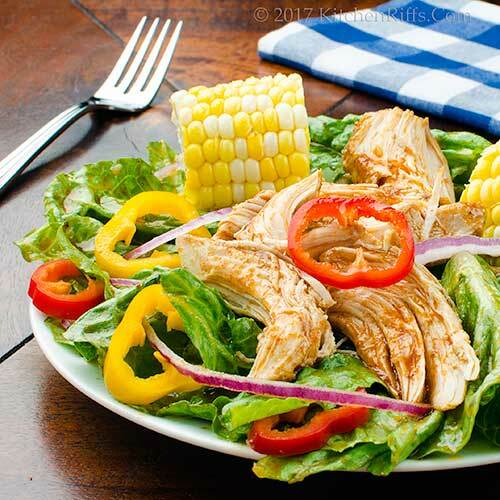 Love me Tender...Love me sweet... you gotta love Elvis and this tasty BBQ chicken Salad. Perfect for a bit lighter fare but full on flavor. Hi Bobbi, Elvis is great! So is this salad. :-) Thanks for the comment. The corn looks so cool and welcoming plated like that. I want to dive right in. Hi Laura, that corn does look mighty tempting. :-) Thanks for the comment. Hi Alyssa, food memories are some of the best, aren't they? :-) Thanks for the comment. Loved this salad! This is going to be my new favourite sald recipe, John! John, adding bbq sauce to the dressing is brilliant. Not sure that would have occured to me as we use balsamic so much with the occasional homemade ranch thrown in now and again. Great idea for a change of pace and real bbq flavor! What a great way to use up leftover barbecue! In fact, I think I'll grill extra so this yummy salad will be on our menu rotation very soon!! Whoa! This sounds awesome! French dressing has never been my favorite because it's so sweet but with BBQ sauce I could totally get behind it :). Yum--brilliant recipe! Hi Agness, you'll like! :-) Thanks for the comment. Hi Judy, BBQ works really well in salad dressing -- or at least this type of salad dressing. Really adds terrific flavor. Thanks for the comment. Hi Liz, we never have problems with too much BBQ so always make extra. :-) Thanks for the comment. Hi Kelsie, I've never liked that "French" dressing either for the same reason. But BBQ sauce instead of ketchup in essentially the same dressing? It works! Thanks for the comment. Fabulous recipe John! I'd never think to have BBQ flavors with salad, but this sounds scrumptious! Hi Deb, BBQ salad is good stuff! :-) Thanks for the comment. BBQ chicken for the salad? I'm in. Hi Holly, it's really good. :-) Thanks for the comment. With 100+F temperatures, a salad like this makes a perfect meal! Yours is so colorful and the chicken looks amazing! Love the BBQ salad dressing! Great idea! Thanks John and hope you and the family have a Happy Fourth! Hi MJ, the chicken is terrific in this! And the dressing is dynamite. :-) Thanks for the comment. What a great salad bbq-for when you can't decide which you want more! Love French dressing so I have no doubt I'd love this!This is one recipe where I won't be hitting return to sender! I used to love the BBQ chicken salad at Panera, but they don't have it any more. So I'm the position of having to make my own! So your post is timely. Really like the idea of thinning down the BBQ sauce to make the dressing - I'll need to give that a try! Hi Abbe, :-) this definitely sounds like your kind of dish! Thanks for the comment. Hi Jeff, glad to be of service. :-) Thanks for the comment. Hi Carolyn, it's a fun idea, isn't it? And such a good dish! Thanks for the comment. Wow! 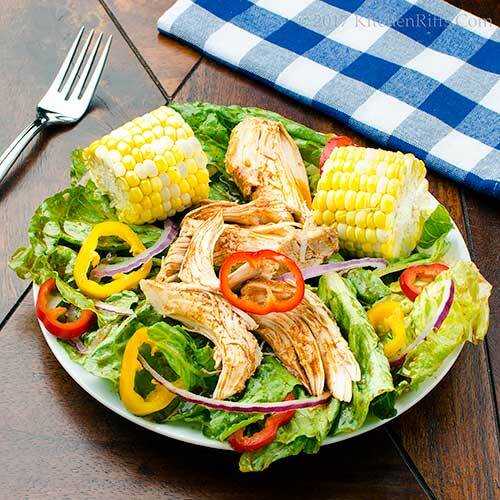 what a great idea to add bbq sauce to the dressing to make this the perfect summer salad. I bet this is delicious! Hi Cheri, isn't this a fun dish? Love the dressing! Thanks for the comment. Hi Greg, we're in the mood for this often. :-) Thanks for the comment. 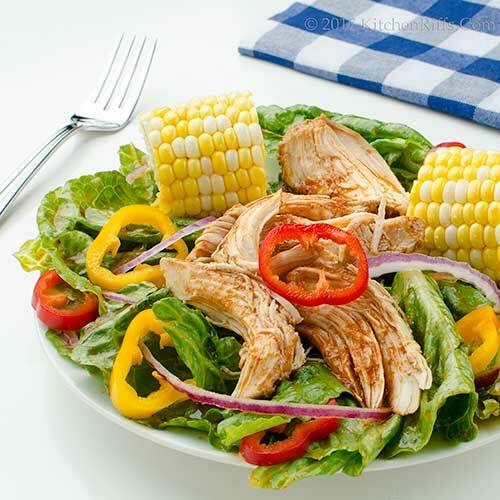 Summer fresh salad and love love barbecue chicken and I am craving it now. Hi Asha, this is such a nice way to get all the BBQ flavor in a lighter form. :-) Thanks for the comment. My kind of salad! Looks terrific. This is my kind of salad, only that I will swap chicken with halloumi since I am a vegetarian. Hi Taruna, halloumi would be nice this this -- great idea! Thanks for the comment. That looks like the perfect meal on a warm summer night. All the main food groups -- and a big punch of flavor, too. I don't know why I can never think up good things like this! Your dressing would be great on a salad, John and is a must try. Thanks for sharing! Hi Carolyn, lot of fun flavors in this dish! :-) Thanks for the comment. Hi Pam, you'll like the dressing! It's really good. :-) Thanks for the comment. Hi Ritu, yup, definitely a one-dish meal. :-) Thanks for the comment. Hi Frank, I've always wondered the same thing! Never made sense to me. :-) Thanks for the comment. What a terrific salad - it looks like summer on a plate! Hi Beth, it IS summer on a plate! :-) Thanks for the comment. What a great salad John, I love the idea of adding barbecue sauce to the dressing. Hi Gerlinde, the BBQ sauce makes a really tasty dressing! Thanks for the comment. 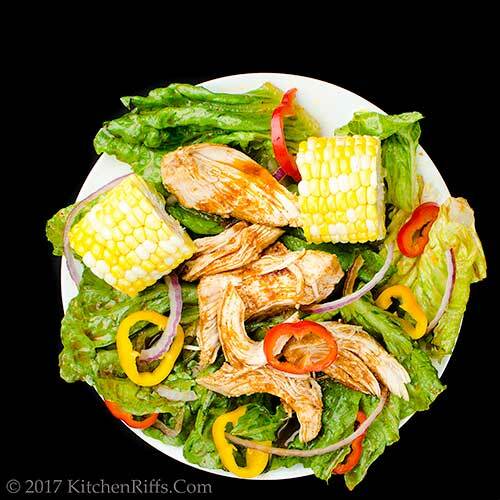 I love this salad and the fact you actually put cobs of corn on it is so much more fun than the kernels. Hi VIcki, the cob is fun, isn't it? :-) Thanks for the comment. This honestly is my type of salad, I can live without any sides. Hi Raymund, we love a hearty main course salad, too! Thanks for the comment. Hi Evelyne, since you're one of the three, you'll definitely like this salad dressing. :D Thanks for the comment. John, this looks like something I need to get on the menu real soon! I like that you tell people to get the gunk off the canned beans! Hi Jean, that gunk is, well, gunk. :-) I know some people think it adds flavor, but never did anything for me. Thanks for the comment. What a great salad, John! Hi Anne, you'll like using bbq sauce in the dressing! Thanks for the comment. Hi Claire, isn't it a nice one? Thanks for the comment. I totally agree about the non-BBQ sauce salad dressing. Doesn't really make sense, does it? This salad makes a great deal of sense to me! Hi Debra, it has always seemed so odd that they'd use regular salad dressing in a bbq salad. This is the perfect solution! Thanks for the comment. Hi Juliana, the dressing is SO good! Thanks for the comment. This looks so interesting and perfect for the time of the year. Great recipe John. Hi Amira, isn't this nice? Lotta flavor in it. :-) Thanks for the comment.